All that rain pelting down in the North Bay is good news for local lakes and reservoirs, but for one little duck, not so much. 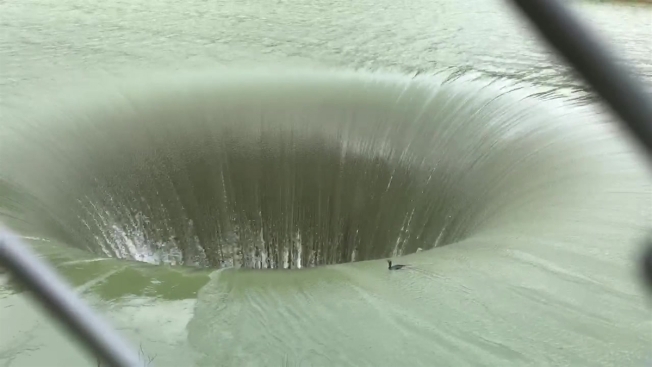 Chuck Fowler was near the Monticello Dam at Lake Berryessa, located 70 miles north of San Francisco, when he spotted a duck getting sucked almost 200 feet into its famous "Glory Hole." Fowler’s niece Tori Junes Fowler posted the video on her Facebook page where it went viral. Her caption read: "Duck took a wild ride but did make it out on the other side!" However, nobody knows if it actually made it to the other side. Fowler, who lives near the Monticello Dam Spillway — also known as the Morning Glory Spillway — said that when the dam reaches capacity, the spillway swallows water at an enormous rate. It drops straight down 200 feet and sends water through an 8-foot wide pipe. Brionna Ruff, spokesperson for the Bureau of Reclamation, told KCRA there’s no way to tell if the duck made it. "From what I understand that water is going down really fast and when things come out the other side...I don't want to get really graphic," Ruff said. According to Ruff, the distance of the fall — about 18 stories — combined with the intense pressure of the water — would have killed the duck. "The chances do not look good for the ducky." In 1997, a UC Davis student drowned and died after being pulled into the hole while swimming.